Local 1775 thanks John Grey for 40 years as Local 1775’s attorney! John’s first meeting was July 19, 1975. John is an active member of the IAFF, after being granted special disposition by the IAFF in the 1970s while serving as an attorney and union organizer for Local 1775. The Executive Board adopted Resolution 2015-1 unanimously at the July 9th meeting, “Recognition of John Grey IAFF Local 1775 Labor Attorney.” John was also presented with an IAFF pin, union Executive Board polo, a framed original copy of the resolution (read below), a bronze inscribed trumpet, and framed patch collection showing the 11 patches of all local 1775 represented agencies. The other shoe has dropped in the latest effort to roll back the retirement security of firefighters and it’s a profoundly devastating one for the next generation. A new ballot initiative introduced today (June 4) would impose a Wall St.-style privatized retirement on new firefighters, police officers and other public workers, beginning in 2019. The measure would also require voter approval for any change in state or local pensions. 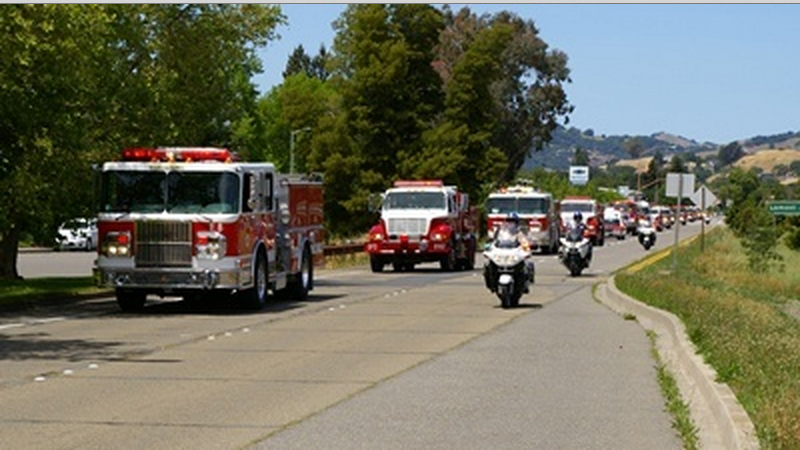 Marin County, CA, April 23rd and 26th, 2015 — Members of the Marin Professional Firefighters, IAFF Local 1775, along with the Muscular Dystrophy Association, will kick off the fire fighters' annual Fill the Boot fundraising campaign to help save and improve the lives of people fighting muscle disease in the Marin County area. Muscular dystrophy, amyotrophic lateral sclerosis (ALS) and other related life-threatening diseases take away people’s ability to walk, move, smile, talk and even breathe. More than 30 members of Marin Professional Firefighters, IAFF Local 1775, will fan out across the county with boots in hand for this year’s drive on April 23rd from 8:30 AM – 4:30 PM at 3rd Street and Grand in San Rafael, at The Hub in San Anselmo, and at Vintage Oaks in Novato. On April 26th, they will be in Sausalito and Tiburon for the Opening Day on the Bay from 10:00 AM to 3:00 PM. MANDATORY FOR SHOP STEWARDS AND ASSOCIATION OFFICERS!